There’s a reason the experts say that breakfast is the most important meal of the day, and that’s because of all the tasty food options. But none is quite as satisfying and filling as the omelet. With seemingly unlimited ways to cook this favorite egg dish, there’s an omelet to suit every taste. You’ll want to skip the snooze button and head straight for one of these 10 best spots to get an omelet in Alabama. This breakfast and lunch joint is breakfast the way it should be—hot, fresh, and satisfyingly delicious. Their chef-prepared omelets are not to be missed. Take your pick of the Creole, a delightful combination of shrimp, sausage and all the trimmings, or the Veggie that chock full of fresh spinach, mushrooms, tomatoes, and goat cheese. Touted as Phenix City’s best kept secret, the fluffy three-egg omelets here are quite the breakfast gem. Along with classics like cheese or western omelets, feel free to get creative with the Irish omelet (corned beef hash) or the chili and cheese omelet. And the service is among the best you’ll find anywhere. This charming little breakfast nook packs big flavor into their Cajun seafood omelet, filled with blackened shrimp and their secret seafood sauce. Situated in beautiful downtown, you’ll have plenty of street views to keep you company during your dining experience. A local favorite for breakfast, lunch, and dinner, you’ll find some of the best home cookin’ in the state inside. The omelets here are simple, but that’s because Bonnie’s Kountry Cafe knows how to do them right. And the only thing that’s better than the omelets here is the friendly service that makes you feel like part of the family. This little breakfast spot is the prime destination to get made-to-order omelets any way you like. Locals love it because they can get a tasty breakfast at a fair price. It might be small, but don’t let the outside fool you—this place is brimming with big tastes. The only thing better than omelets here is the fact that you can get them all day on Saturdays. If you’re looking for a hearty breakfast to keep you filled, go for the Philly steak omelet that gives you all the best flavors of this classic lunch favorite but without the extra carbs. What this places lack in size makes up for in flavor and omelet variety. You can order your omelet just the way you like to get the custom flavor you crave. Their customers flock to this place because of the friendly service, which has been touted as some of the best in town. Delicious and inexpensive, Duck’s Diner is serving up some of the best omelets and other breakfast favorites on the Alabama coastline. Along with superior service, diners love their small but tasty variety of omelets that satisfy every appetite. Their Special omelet is packed with sausage, tomatoes, spinach, and feta cheese, and is not to be missed. This country farmhouse-vibe eatery lets diners build their own omelets to create their perfect concoction. Here you can choose your meats and veggies, and their fantastic breakfast chefs do the rest. There’s no way you’ll walk away hungry after filling up on one of their delicious omelets! 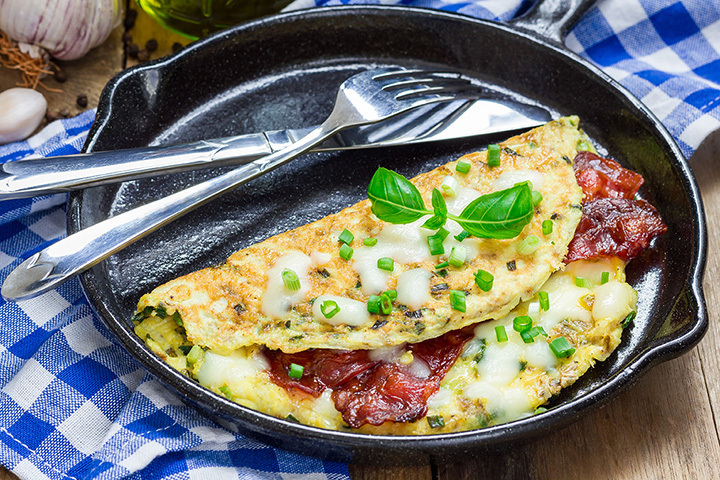 Hearty and healthy, you get to choose your ingredients to craft the perfect omelet. Each one comes complete with a side of grits, tots, or hash browns, and a biscuit with gravy or toast.